Sunday in our house was always a great day. The Da’ would be up at the crack of dawn dragging the lads out of their beds to go to Mass. Because he’d been in the army everything had to be done in military precision so as keep some kind of order with fifteen children. Everything was done in shifts. The girls were always up first on Sunday morning because they needed to use the toilet. The boys had to march out to the backyard and pee down the drain hole outside the back door. And if you weren’t quick enough whoever came behind you was likely to pee down the back of your legs. We’d have a quick duck under the cold-water tap for a wash as we passed through the kitchen on our way back upstairs. The boys back then didn’t wear underpants or anything like that. So it was a mad dive into the big wardrobe in the back bedroom for a dirty clean shirt to wear to Mass. The Da’ was great on Sunday mornings because he’d have a fry going for us for breakfast. He’d give each of us a fried egg on fried bread and a plate of bread and dripping all washed down with a cup of tea. Most of the cups in our house were either cracked or chipped but who noticed? We certainly didn’t because if you hesitated to eat or drink anything at our table the rest of the gang jumped on it and scoffed it down before you could change your mind. After ten o’clock Mass we were thrown outside to play with our pals, regardless of the weather. Then the kitchen was in full blast with the Ma’ and Da’ getting things ready for our Sunday dinner. The smell of boiling cabbage and and cow’s tongue filled every corner of our house. On the odd Sunday the Da’ would send one of the older brothers to Cafolla’s shop window on Fassaugh Avenue for a block of ice-cream and a packet of wafers. At our dinner table we looked like ‘The Waltons’ off the television. The Ma’ and Da’ sat at the top of the table facing downwards and each of us according to our age from eldest down to youngest took our rightful place around the table. We didn’t of course have enough chairs or stools for us all to sit on so most of us had to eat our dinner standing up. Now nothing in our house ever went to waste, especially when it came to food. We all had to play our part in the clean-up after dinner. On a fine Sunday afternoon the Da’ would take a gang of us younger ones up to the Phoenix Park for a ramble. He never brought us into the Zoo, he’d have us walk around the outside and peek in through the railings at the animals. Back home my mother was busy baking a cake or two for the Sunday tea. By the time we all returned home we’d be starving again. We’d have batch loaf sandwiches filled with meat left over from the dinner, bread and margarine and a slice of my mother’s tea brack. Our teapot was actually a big old style kettle that you needed both hands to carry it to the table. Some of us would try to be posh and use a tea strainer to catch the tea leaves in. Then the Ma’ would read my sisters’ tea leaves. According to the tea leaves they should have all married tall dark strangers. When the tea was over we’d have to do our ecker or homework for school the next day. 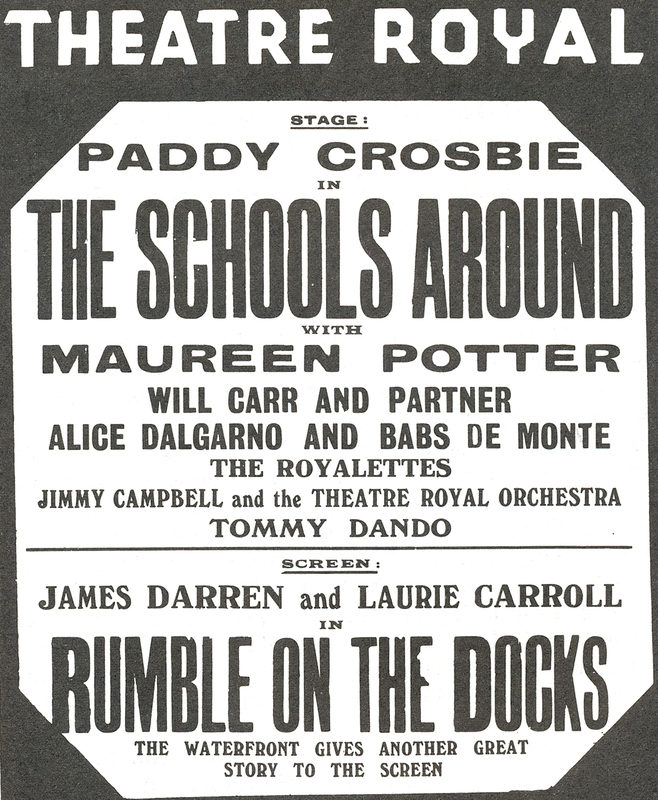 Then it was out to play with our pals agains until Paddy Crosbie came on the old black and white television screen with ‘The School Around the Corner’. We’d all sit on the floor in front of the telly mesmerized by the culchie accents of some of the little boys and girls on the show. I remember one time there was a young boy on it who said he’d never been to the seaside, I think now that his family was from the midlands somewhere. We all laughed at the idea because we were always brought to Dollymount, how could someone never be brought to the seaside? 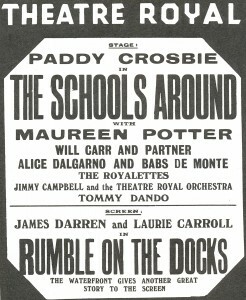 Paddy Crosbie was great fun with kids and their funny stories, recitations and jokes. When that was over we watched the Black and White Minstrel Show on the BBC station. The Da’ would join in singing all the ould songs and especially if they were old army songs…’Bless them all, bless them all, the long and the short and the tall…’. In my head I can still hear the Da’ singing and the Ma’ laughing at him as her knitting needles clicked and clacked in time to the music. Yes Sundays in our house in Cabra West were some of the greatest time in my young life.